Today in Utah we are celebrating the 24th of July or “Pioneer Day” so I made a cake. Ok, I didn’t really make this cake in honor of Pioneer Day, it was just a coincidence that I’m posting a cake today, but we can just pretend. Anyway this simple Glazed Lime Cake about put me over the edge the other day. I’d made it awhile back and never posted it so I decided to make it again so I could share it with you. Well, I decided to try a few “tweaks” that led to epic fails and I ended up throwing away the first two I made. Oh I wanted to cry. . . three sticks of butter in the garbage! Ugh!! Thankfully, the third time was the charm. 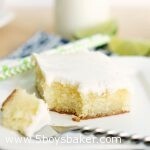 This cake is so moist and flavorful. 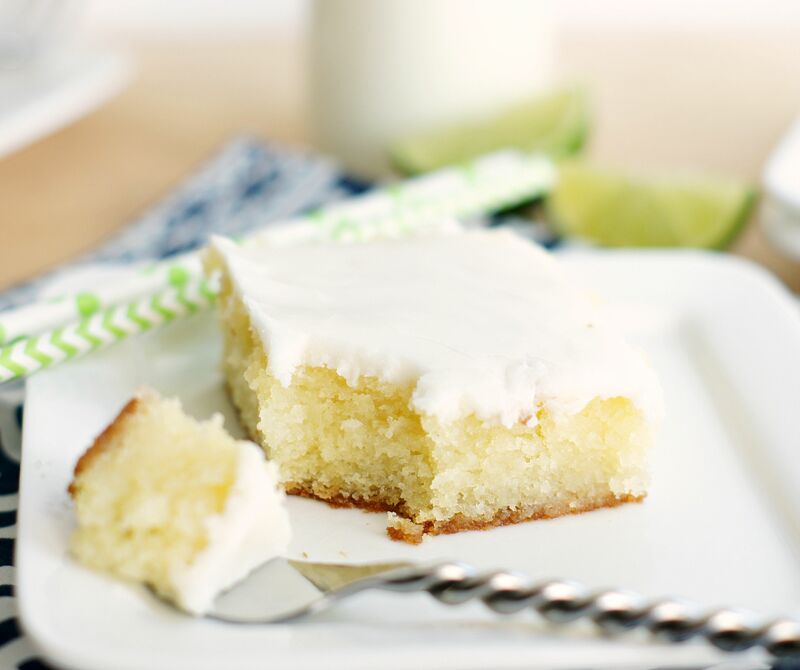 While it’s warm you pour a lime syrup over it that soaks in and makes this cake amazing. 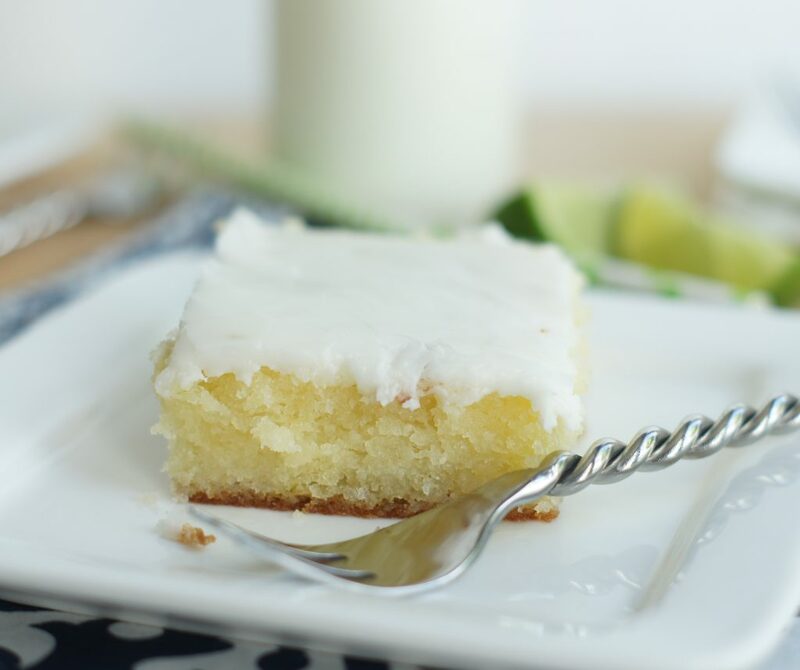 This cake is so simple to throw together. It’s one of those cakes you can throw together on a whim. The lime flavor is so refreshing and absolutely delicious! Perfect for a summer BBQ or for any occassion. 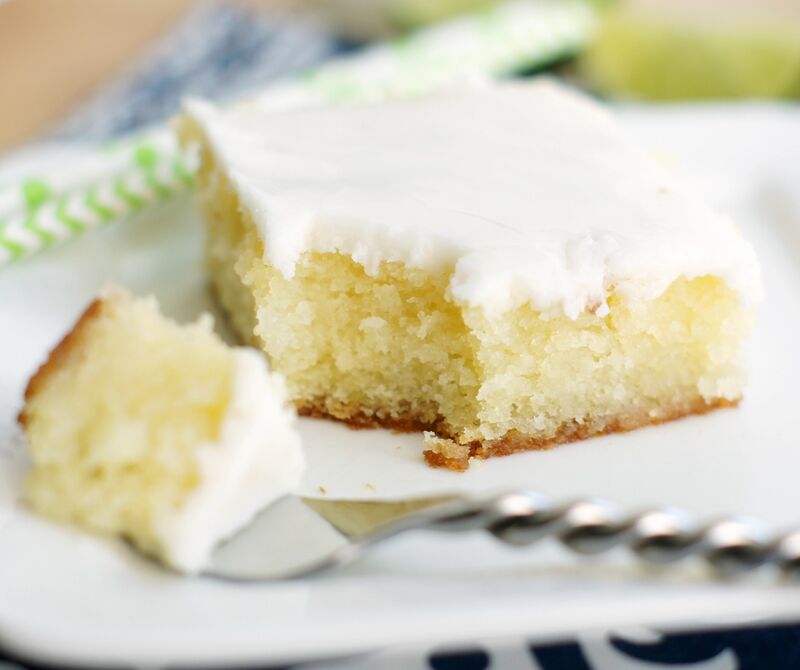 A delicate, moist cake soaked with a lime syrup and topped with a lime glaze. Perfectly delicious! Preheat oven to 350ºF. Spray a 8x8x2-inch metal baking pan with nonstick cooking spray. Beat butter and powdered sugar on medium until well blended. Add eggs 1 at a time and then add vanilla. Beat in milk, then flour. Transfer batter to prepared pan; smooth top. Bake cake for 25-30 minutes or until a toothpick inserted in the center comes out clean. Meanwhile, finely grate enough lime peel to measure 1 tablespoon. Cut limes in half and squeeze enough juice to measure 6 tablespoons. Stir lime peel, lime juice, 7 tablespoons sugar and 1 tablespoon hot water in small bowl until sugar dissolves. Set lime syrup aside. Using skewer, poke holes all over cake. Spoon lime syrup evenly over hot cake. Cool cake completely in pan on rack. To make glaze: Whisk melted butter powdered sugar, lime zest and just enough lime juice to make a pourable glaze. Whisk until smooth and combined. Pour over cooled cake and spread evenly. I love lime! I’m so excited to try this! Do you think is would work as cupcakes? I haven’t tried it, but I think it should work. It’s worth a try! Let me know if you try it. Thanks for looking. Jodi, this cake looks so luscious and moist! Yum and lovin’ the lime! Perfect for summer, thanks for sharing! Thanks Kim! It’s so delicious, hope you have a chance to make it. Thanks for looking!